Over one weekend at Brisbane’s Studio 180, didgeridoo master/composer William Barton and virtuoso guitarist/composer Anthony Garcia came together to create a unique musical offering, Desert Stars Dancing. The subtitle Eclectic Sound Scapes for Didgeridoo and Guitar reflects the colour and diversity of this recording with both artists freely exploring the possibilities of their instruments to the fullest. With renowned recording engineer Dave Neil helping guide the artists through this acoustic sojourn Barton and Garcia have created a new sound world that defies description. Barton plays both guitar and didgeridoo on the title track, Desert Stars Dancing, as well as bass guitar on The Ground Beneath Us and electric guitar on Electric Landscapes. The musical landscape of this recording traverses and weaves between the natural beauty of the Australian landscape, funky rhythms and contemporary grooves and even includes a Mexican inspired jam in the final track Meridional. Garcia also steps out of his traditional role as a classical guitarist by playing banjo on Morton Bay and joining Barton on the electric guitar in Electric Landscapes. By experimenting with a combination of traditional composition techniques, improvisation and digital processing this CD manages to combine the didgeridoo and guitar in a range of distinct settings reflecting the artists capacity to play, twist and turn genres inside out. The ensemble achieved throughout the recording is testament to the artist’s creative and emotional connection. 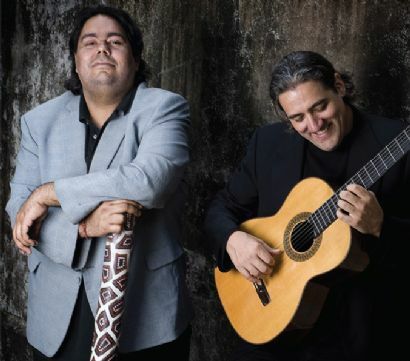 In White Notes Between Heaven and Earth, a largely improvised work originally commissioned for the Maleny Autumn Music Festival, the classical guitar and didgeridoo weave together as one with Barton spontaneously adding a vocal cadenza to close the work.